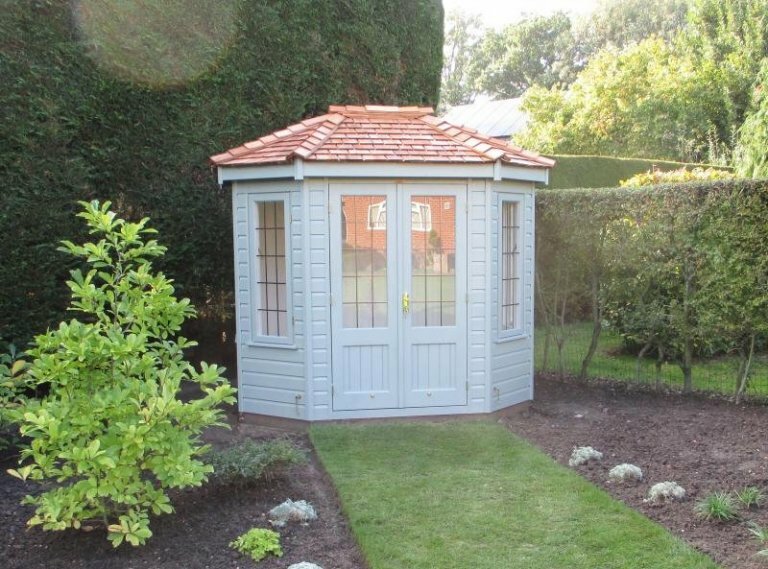 This octagonal garden building is a 1.8 x 2.5m Wiveton Summerhouse, and it has been installed in a section of our customer’s large garden in Framlingham Earl, Norfolk to use as a peaceful relaxation room to allow the customer to sit inside and enjoy her garden from. This size is perfect to fit one or two chairs inside, with a table, creating a wonderful little haven for the customer to get comfortable in. Cedar shingle tiles have been used on the roof, which are made from the highest, construction grade cedar for maximum longevity. For more information on our roofing materials, please read this article: Crane's Roofing Material Options. Leaded windows add a traditional style, and the summerhouse has been painted in the colour Sage from our Valtti Paint Range. To order some paint samples or to learn more about our paint, please click here. 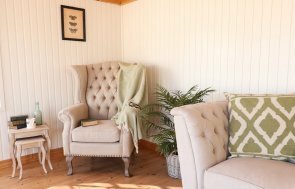 Internally, the customer chose painted matchboard lining, double glazing, and insulation in the walls and ceiling, to make sure the Wiveton will be comfortable to use throughout most of the year. 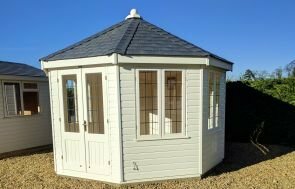 If you would like to know more about our lovely range of Summerhouses, please call us on 01760 444229 to ask us any questions you may have, or you can also send us an online enquiry. Alternatively, to see where the magic happens, you can come and visit our HQ in Norfolk (located between King’s Lynn and Swaffham on the A47), to see our vast collection of garden buildings.